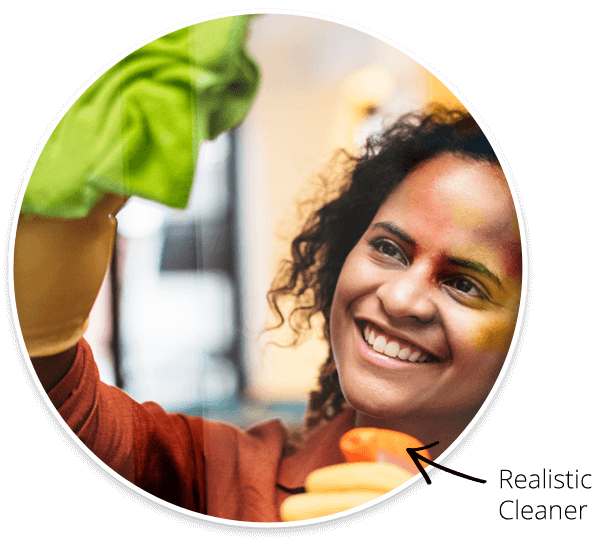 Marigold - What's Your Cleaning Style? Are you a seasoned cleaner or have your never picked up a cloth in your life? Do you have a dedicated cleaning kit for each room or do you grab the nearest cloth and go? Whatever your cleaning style, there’s a Marigold product for you. Take our quiz to discover your cleaning style and our recommended cleaning bundle – we're even giving away ten cleaning bundles for free! Plus one lucky winner will win a £250 Voucher to spend on whatever you like - after all we know everyone has their own style! Synonymous with cleaning, Marigold now has a solution for every occasion, whether you’re cooking, cleaning, DIY-ing or just generally doing dirty jobs, your hands will be happy. In light on the new GDPR laws coming in, our job was to increase the data capture of the Marigold audience as well as showcase the variety of products Marigold have to offer for different scenarios. Taking inspiration from BuzzFeed style quizzes such as 'What Simpson character are you?' we curated a simple intuitive sweepstake competition that determined what style of cleaning the user may have. The challenge was to identify what approach to cleaning the user had through a set of simple lifestyle questions, then recommend a package of products that would best suit their cleaning style. The competition incentivised user engagement by giving them the chance to win £250 as well as ten curated cleaning bundles. The other factor for engagement, was the user's curiosity to find out their cleaning style creating sharable content and in turn converting plays into sales. The intuitive easy to use multiple choice questions allow the users to complete the quiz in just a few minutes. Strategically placing the entry form at the end of the quiz, incentivised the users to progress to the final step and reveal their curated result. 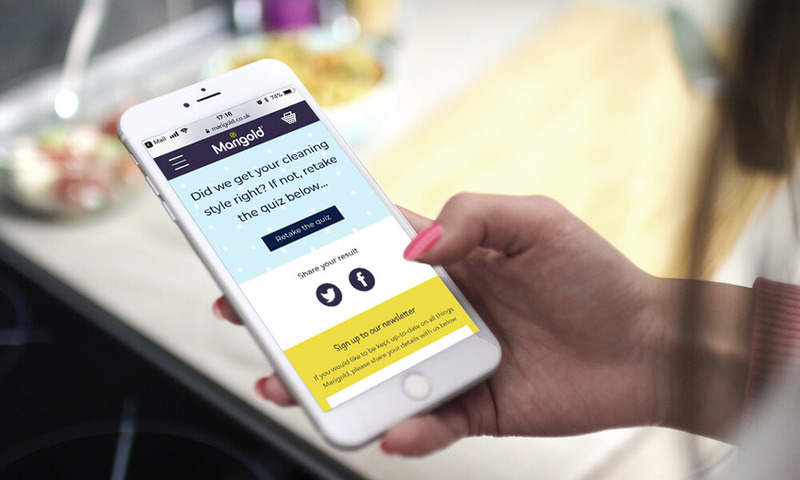 Once finishing the quiz the user is presented with a personalised animation that talks them through a few of their cleaning traits as well as recommending a cleaning bundle suited to their style. The curated answers gave the user content that they could share across Twitter and Facebook as well as build engagement around the competition. 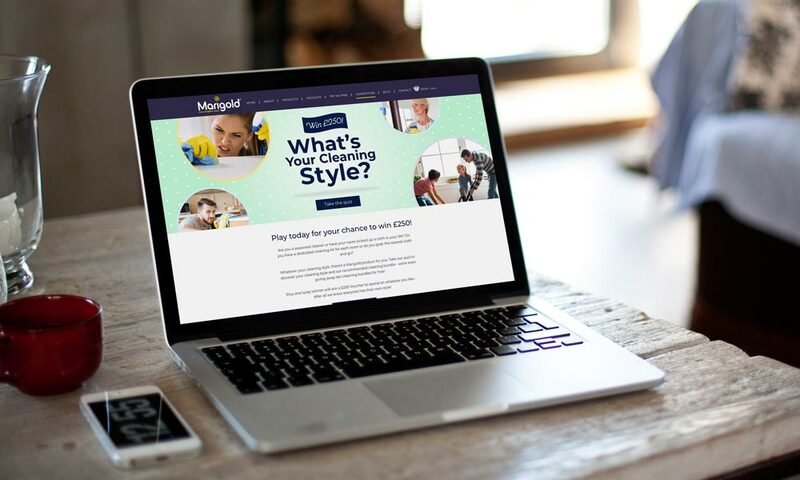 Along side the competition page we released a email marketing campaign that contained bitesize content blocks around Marigold products, incentives, tips and products. Over 6000 entries and 2600 database sign ups. Not bad for a budget of £1500. I also babble, act professional and hoard.